Explore the Roman Walled city of Lugo which for many offers the best in Galician tapas! You will learn about the different food & wines from Galicia. Lugo is also and, above all, a city with a splendorous Roman past, which is evident in it´s wall which is a World Heritage Site, Roman Baths, Roman Bridge, and do not forget the Cathedral. Take a stroll with our foodie guide an stop to enjoy tapas and wine at three different bars/restaurant in the historic quarter of Lugo. An excellent way to find the best stops for tapas & wines in the Roman Walled City! Lunch (12:00PM) or Dinner (19:30PM): Meet your Private English-Speaking Foodie Guide at a designated meeting point or at your hotel if you are staying in a city centre hotel. 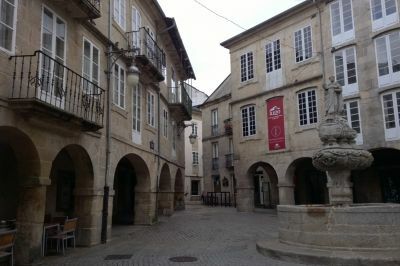 You will take a walk with your guide thru the old town of the Roman city of Lugo. One of the best cities in Galicia for tapas crawls! Enjoy tapas and wines in three different establishments in the old quarter with commented tastings and explanation of the different tapas savored. (L or D ) Lunch or Dinner, the tour price includes approx. 4 drinks (Galician wines selected by our expert) and 4 tapas plus various bites/tastings during the tour. Transportation is not included you get to the meeting point and from the ending to at your own arrangements. No other beverages are included outside of what is tasted with your guide selection of wines. All extras must be paid directly. Tips & Gratuities are not included nor are the mandatory but always welcome if you had a good time. Or at your hotel if you are staying in a city centre hotel.